You know those recipes that you enjoy from others and you like them so much that you just have to ask for the recipes? Well here’s a recipe that I did just that! Last week after my mother’s funeral, her neighbors brought over some delicious eats that we very much appreciated. Included in their basket of goodies was this creamy, cheesy southwestern corn dip. I had to get the recipe! Following a search on Pinterest, that left me confused with 100’s of versions, I decided to call my mother’s neighbors. They were thrilled that I asked and gracious to share the recipe. It’s so easy and fast to make too! I made a few changes such as adding red and green peppers into the mix, the cilantro, and a fresh tomato and jalapeño. It truly amped up the whole flavor! Since it has been a wonderful summer with lots of rain in Iowa (where the funeral took place), the sweet corn was early and ready to pick. So I bought 2 dozen ears of corn to bring home to South Carolina and splurge on with my husband. I had enough left over to add into this salad. The variety that can’t be beat is called “Peaches and Cream”. 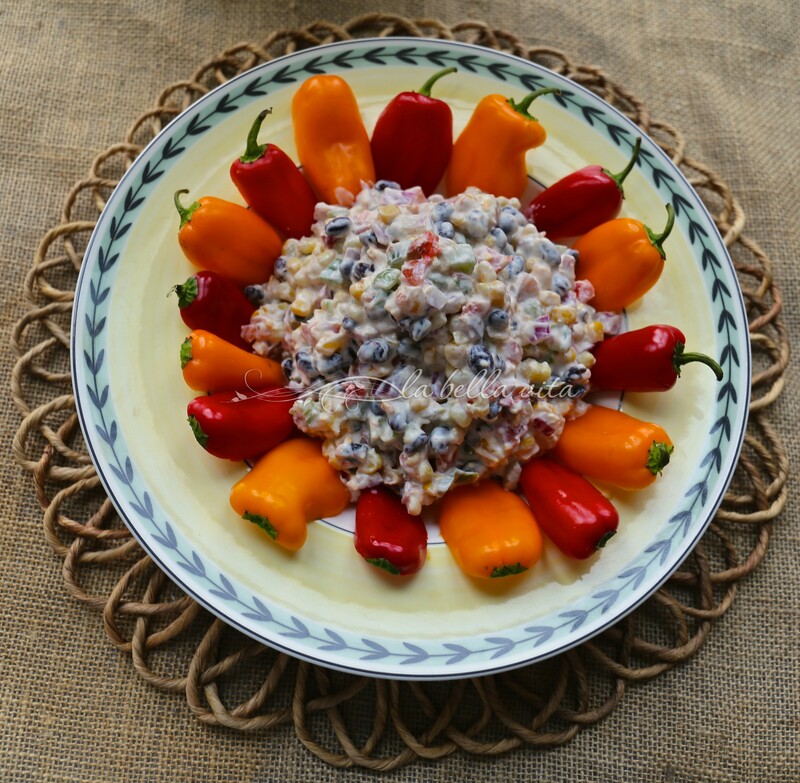 I served this on a pretty yellow platter to highlight the yellow corn and made a circle of the mini-pepper ‘scoops’ around the dip. I really like to be creative in presentation! The next way that you can also present this delicious Cheesy Fiesta Corn Dip is to have the mini peppers already filled with just under a teaspoon of corn dip in each. Or you can serve it both ways! 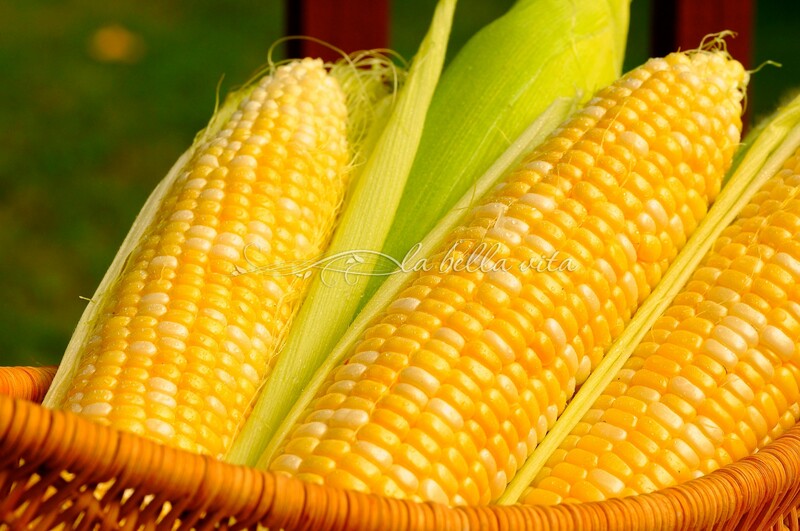 This fresh corn dip is so yummy, that I am taking it to my grandson’s birthday party today for everyone to enjoy. 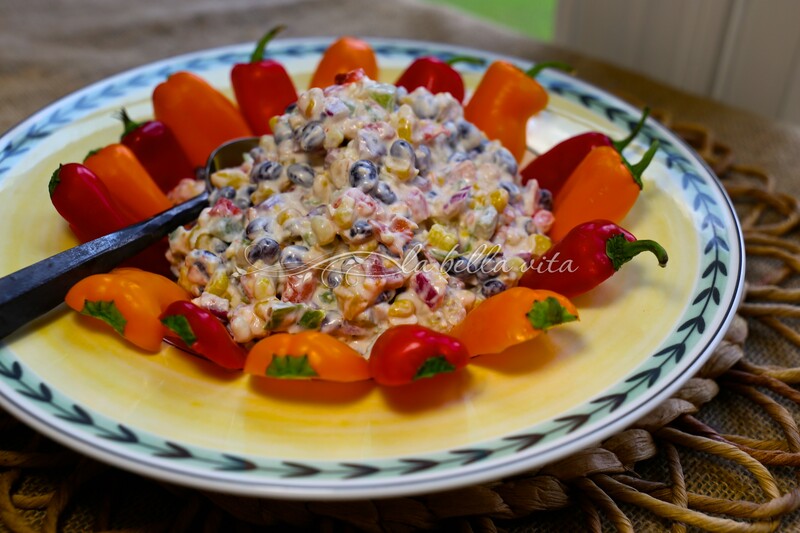 I hope that you too enjoy this delicious, easy, summer corn dip! I know that your guests will devour it, as my family did! Chill from 2 hours to overnight to allow all of the flavors to marry. Serve with mini peppers to use for scooping up the dip and/or tortilla chips. You out did yourself with the absolutely beautiful presentation of this dip! 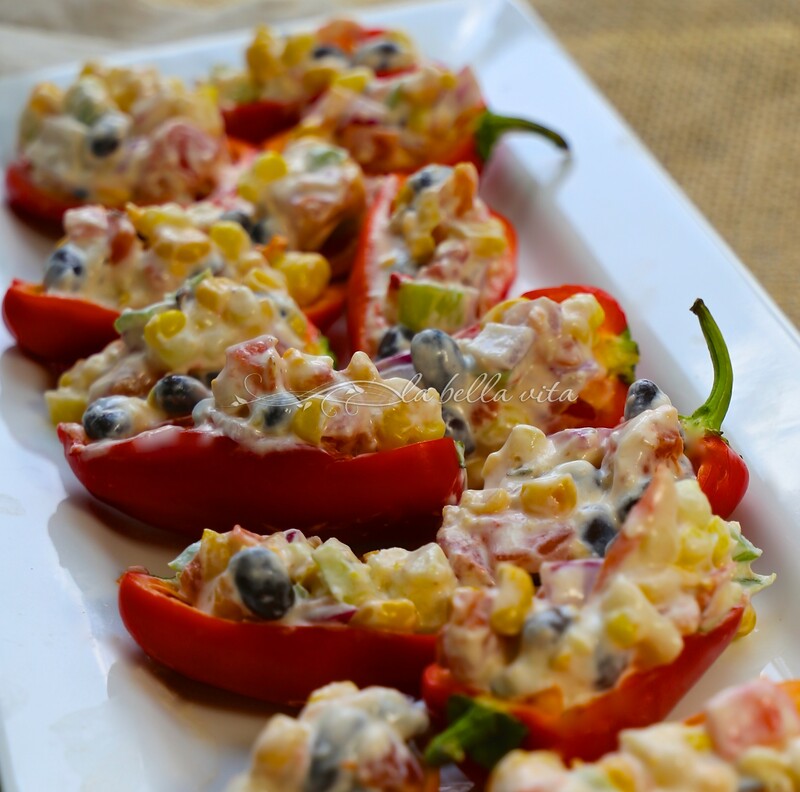 I could take a bite out of those little pepper halves filled with the corn dip right now! So sorry to hear of your mother’s passing. Thanks so much Judee for your kind thoughts about my mother. I know that she would have loved this dip too. Her neighbors have been so sweet! Hi Liz, If you make this dip, let me know what you think! So very colourful and tempting with all the freshness and goodness. I would love some too, Roz. Thanks Angie! Hope you’re doing great! Thank you Gloria! You’re so kind! Grazie Chiara! And thank you for always stopping by with a kind comment! Love the dip. It’s so colorful and looks delicious. Hope you’re doing well. I’ve been keeping you in my thoughts and prayers. My poison ivy is gone (at least until I touch it again). There are many people who don’t get a reaction to the oils that cause the rash. I’m not lucky enough to be one of those people but I am lucky in that I don’t get the huge weeping blisters. Thank you for stopping by to say hi ! I appreciate it very much! I still do not get receive your blog posts and thought that maybe if you ‘unscubribed’ me and then I ‘re-subscribed’ that it might fix the problem. Please let me know what you think. This looks so good, Roz! This would be so wonderful with fresh farm-stand corn! Love all of the flavors! Thank you Susan! I agree with using farm fresh corn! It makes this so much more flavorful! Roz, I have been thinking of you. I hope you are doing as good as can be expected. The dip is beautiful. Its cool and refreshing on these scorching summer days. What a kind and thoughtful comment that you left me regarding your concern for my well-being. Time does heal the sorrow of our losses and I have slowly been getting back to my normal routine . . . not very consistent in blogging and commenting, but better late than never! How are your cooking classes coming along? Sounds like so much fun! You’re a great culinary resource for your location! Roz – It’s interesting how food can bring comfort in times of serious distress. Cooking for people is truly a labor of love, in my opinion. How wonderful of you to share the recipe with us. It looks fabulous and I can’t wait to try it. I’m just about to post your swordfish in lemon caper cream sauce. We all just loved it and I know we’ll love this dip too, especially with the sweet summer corn that’s in season now. Hi Linda! I’m going all the way back to any unanswered comments after a year of difficulty and just plain inability to get it all together. Thank you for stopping by with your kind comment and for your continued friendship! Roz, this dip looks great. Sounds so yummy with all the good things that are used in the preparation! Can’t wait to try it. 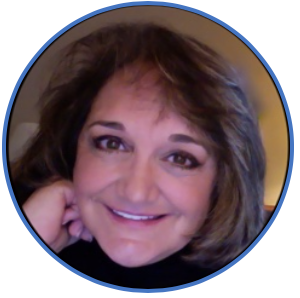 First we “eat with our eyes”, Roz, and your pictures are wonderful—they tell the whole story! Thanks for this post. Thank you so much Diane! I hope that you receive this reply since your email address isn’t connected to your name in your comment! If you tried this dip recipe, let me know what you thought of it please! This looks so yummy, Roz! I love dips of all kinds, and this one has so much flavor going on in it. I really like how you stuffed the mini red peppers with the dip. It’s so pretty. I hope you are doing well! You’d love this corn dip, Shari, and knowing you, your version will be improved with added flavor and pizzazz! Thanks for your concern for my well-being; I’ve been coming along since June when my mother passed, and time is a friend when it comes to healing!